The following is a random collection of requirements and design issues related to the construction of a local area network. Some of the ideas are very preliminary and some of the requirements may conflict with each other. This is a set of notes and should not be taken as a well thought out discourse. 1. We must consider the situation where there are multiple repeaters on the same frequency with overlapping RF domains. Some stations may be able to access all, others just one. Duplex machines won't work (they can hear the users, but not each other due to mixup of in & outs). No interlinking on another band (such as 450) is assumed. The repeaters, links, and users are on the same channel. This is the worst case situation, but a realistic one. 2. No single Control Station should be "in charge'' of the operation of the other repeaters. They all act as fairly independent entities. 3. Users stations ought to be able to move into an area and setup and start transmitting without any prearranged address assignment or placement on a polling list. 4. The long term solution will not depend on unique, permanent assignment of HDLC addresses to users. The callsign is the only item that is really important. 5. 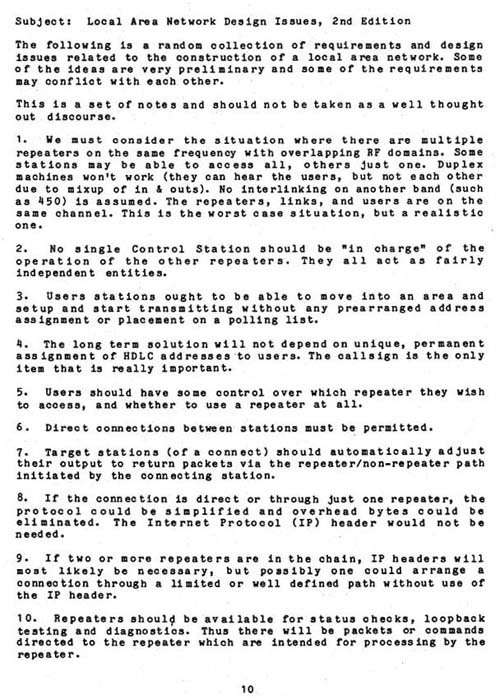 Users should have some control over which repeater they wish to access, and whether to use a repeater at all. 6. Direct connections between stations must be permitted. 7. Target stations (of a connect) should automatically adjust their output to return packets via the repeater/non-repeater path initiated by the connecting station. 8. If the connection is direct or through just one repeater, the protocol could be simplified and overhead bytes could be eliminated. The Internet Protocol (IP) header would not be needed. 9. If two or more repeaters are in the chain, IP headers will most likely be necessary, but possibly one could arrange a connection through a limited or well defined path without use of the IP header. 10. Repeaters should be available for status checks, loopback testing and diagnostics. Thus there will be packets or commands directed to the repeater which are intended for processing by the repeater.